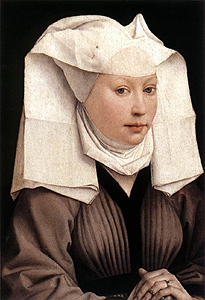 Rogier van der Weyden, 15th century. Linen is a natural fiber that comes from the flax plant (Linum usitatissimum) native to Europe, Asia, and North Africa. It can be spun and woven into a lightweight cloth used for clothing, bedding, and interior decorating. It is highly prized for how comfortable it is to wear in hot or cold weather. Linen has been in use for thousands of years. Flax has been the preferred plant fiber used in textiles for centuries for many reasons. Its long fibers ranging from 18 to 55 inches long make it easier to spin and weave. It is also 2 to 3 times stronger than cotton which makes it more resistant to wear from abrasion. Linen fibers have less elasticity and can break if creased harshly in the same place repeatedly like along a hem or collar edge, but it also keeps it from losing its shape which makes it better for draperies, artists canvas, and clothing. When properly prepared, linen can absorb up to 20% of its weight in moisture before feeling damp. It also releases the moisture through evaporation quickly which makes it feel cool in warm weather. This makes it ideal for summer clothing especially when you are wearing multiple layers. Like silk, it is actually stronger when wet than dry. Mildew, perspiration, and bleach can harm linen but moths and beetles that destroy other fabrics are not attracted to linen. You can dry clean, machine wash, or even steam linen without harm. Historically, linen was boiled to clean it and laid flat on the grass or over hedges to dry. When dried flat and stored folded while slightly damp, linen didn't require any ironing. Natural linen ranged in color from off white to a dark ecru color and could be bleached by exposing it to bright sunlight. The oldest evidence of flax horticulture was found in a Swiss lake bed and dated at 10,000 years old. The oldest evidence of woven linen cloth comes from Egypt and is 8,000 years old. Some remarkable examples of finely woven linen have been found in Egypt. According to Wikipedia, "When the tomb of the Pharaoh Ramesses II, who died 1213 B.C.E., was discovered in 1881, the linen wrappings were in a state of perfect preservation - after more than 3000 years...When the tomb of Tutankhamen was opened, the linen curtains were found intact." 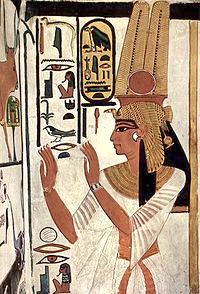 Egyptian men wore kilts made of white linen and the women are often depicted wearing gowns of such fine linen fabric that you can see right through it. The ancient Brehon laws of Ireland which predate Saint Patrick's arrival in Ireland, required all farmers to learn how to grow and process flax to make linen. Flax farming was more labor intensive than cotton, but flax plants could grow in cold climates where cotton couldn't, so flax cultivation dominated in northern Europe along with wool. Silk and cotton were imported from warmer regions but the transport costs made them much more costly than linen or wool in the Middle Ages. The flax plant was harvested by pulling the entire plant out of the ground or cutting the stalks close to the soil. The plants were then left to rot in retting ponds or streams to breakdown the pulpy part of the stalks and release the long, shiny fibers. This took several weeks. When the retting was finished the long fibers could be separated from the rest of the plant by beating it between wooden blocks in a three-step processes call beating, scutching, and heckling. from Tacuinum Sanitatis, 14th century. By the 16th century, the production of flax had increased so much in England to satisfy the demand for linen garments that King Henry VIII made a law that no one could wear shirts or chemises made of more than "5 ells of that country cloth" or 6¼ yards in modern measure. It seems that so many of the streams, brooks, ponds, and lakes were being used for retting that the pollution caused by the rotting plant material was choking out the fish! If you want to keep the crisp look of new linen, always have your linens dry cleaned, but if you prefer a soft casual look, you can wash linen at home. Linen does shrink a small amount but it shrinks less than cotton and this can be minimized by washing in warm, not hot water, and letting it air dry. The more that you wash linen, the softer and less wrinkled it becomes. If a garment is made of 100% linen and not a blend, it can be hand or machine washed with mild detergent. Never use chlorine bleach because it can damage the fibers. You can use oxygen based bleaches like Oxy-clean¿ without harm . If you have hard water, add a softener to keep minerals from depositing on the fabric and keep the colors bright. Adding a little vinegar to the wash helps keep the colors from fading. Don't wash darks and lights together or the color can migrate. For cleaning perspiration, collar stains, and cosmetics from linen, use a pre-wash stain remover before washing. If perspiration has made the fabric color change, treat the stain with white vinegar, too. After washing, rinse completely and dry the garment in the sun. Never wring or twist wet linen or you will cause excessive wrinkling. If you use a washing machine, set the dial to a mild cycle and don't overload the machine. Linen needs to move around a lot when washing. If washing by hand, wave the garment in the water or stir in circles. Rinse by replacing the water often until it runs clear. Delicate linen items with lace and/or embroidery should be tied inside a pillow case or rag-bag before machine washing and drying to prevent them from getting damaged. If you use a machine dryer, make sure to remove the linen while it is still damp. This prevents the heat from setting hard wrinkles and keeps the fibers from getting brittle. Ruff made of linen, 16th century. Always iron linen while it is still damp. Make sure that you don't have any mineral deposits in your iron from hard water and that the surface of the heat plate is very clean or you could leave spots on the fabric. Use the linen setting on your iron. Iron dark linen fabrics on the wrong side or use a pressing cloth to prevent shiny spots, especially around the seams. Light colored linen may be ironed on either side. If you use a starch, keep the iron moving over the cloth and don't leave the iron in contact with the fabric surface very long or you could scorch it. For the best results when air drying, lay the garment out while it is damp and tug out the creases in all directions then pat smooth with your hands. After it is dry, you can hang it in the closet. Before storing linen in a drawer or box, fold it with a layer of muslin or acid-free tissue paper to prevent creases. If you have heirloom linens like table cloths and napkins that are only used once a year or less, take them out an refold them several times a year to keep them from breaking on the creases. In all the historical depictions of linen tablecloths and veils the creases are clearly visible, so reenactors shouldn't worry about the look of creases. If you want to add this article to your list of favorites or email it to a friend, please use this permanent URL, https://stores.renstore.com/-strse-template/0903A/Page.bok. Permission is granted by the author to quote from this page or use it in handouts as long as you include a link back to Renstore.com.